Transcribed from Concerti Grossi, Op. VI for two recorders and continuo by J. Walsh, London 1714. 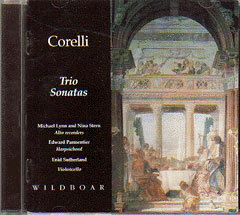 Arcangelo Corelli was without doubt one of the pivotal influences in all of music at the dawn of the eighteenth century. Immensely popular, all of his fame and popularity devolved from a scant six collections of orchestral and chamber music, mostly published near the end of his life, but widely circulated in manuscript for decades before. Shortly after the publication of the Opus VI Concerti Grossi, John Walsh set to work in London transcribing them for two recorders and continuo, a combination he knew would find favor among the English amateurs of the day. They were published in 1720 and proved sufficiently popular to warrant a second printing a decade later. These transcriptions were carefully done, far more ambitious than a simple transposition to suit the range and capabilities of the alto recorder. Movements were borrowed or moved, new movements introduced from unknown sources, elaborate means employed to ensure that all of the music in the original five or six parts found expression in the three parts of these trios.